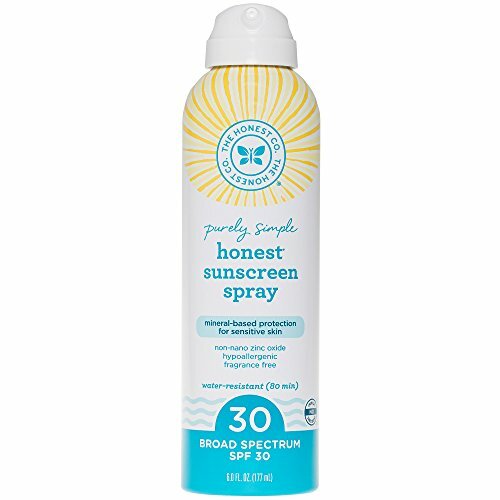 The Honest Company SPF 30 Sunscreen Spray, 6 fl. oz. The Honest Company SPF 30 sunscreen spray, 6 fluid ounce -- 1 each. Our pure, mineral-based non-whitening sunscreen spray is super easy to apply for no mess, no fuss fun in the sun. Advanced broad spectrum sun protection -- no chemical sunscreens, just pure mineral non-Nano zinc oxide quick dry, easy-to-apply continuous spray -- great for kids (big and small), sports and outdoor fun sprays evenly and smoothly for full coverage lightweight and plant-based formula is comfortable to wear and great for sensitive skin water resistant (80 minutes) shake well before use hypoallergenic -- ph balanced -- plant and mineral-based -- non-greasy non-whitening -- long-lasting - quick dry.